The late Mr Qoopane was a man who even if one met him once in a lifetime, one would almost certainly remember him, the experience for ever. He embodied everything a man of letters would relish, and this much can be discerned from this particular book of his. Africa has never been renowned for its high levels of scientific and technological excellence, and it is no surprise that in Mr Qoopane's account here, he stresses the spartan facilities that existed at Somafco, when he attended the institution decades ago in Tanzania whilst in exile. The supply of water, electricity, even telephone facilities was less than impressive - "like statues" as the author writes here, in matter-of- fact fashion. Yet he enjoyed his stint at Somafco, in exile generally. That is the bubbly Flaxman Qoopane for you. In those days the life of a journalist in the heart of an African country was devoid of the sparkling glamour of nowadays; there were no mobile phones, smartphones, laptops, nothing like the internet etc. The typewriter was king then, and no surprise to see one perched on the cover of this book. But never mind. Despite the spartan life, amenities of yore, true talent still rose to the surface, and Qoopane began to distinguish himself as a brilliant reporter, photographer and all-round journalist right from his heyday in east Africa, which continued after he returned home to South Africa. He always excelled in finding excellent, even unique news/feature stories to the admiration of his readers everywhere. This book of his of course is too brief, considering his colourful career as a journalist who published hundreds of stories in many publications. But the fundamentals are here in this book. We know the genesis, and what made him tick. Beautiful review of The renowned literature greatness, Mr Qoopane. He has left the impressive legacy that will celebrated moons to come. His literary gallery, his journalist work abroad and locally. Dr Thiba is right. 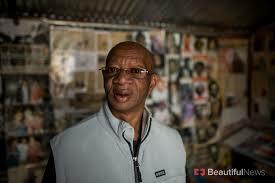 Ntate Qoopane distinguished himself in his much beloved field: literacy and literature. Books like this one constitute ineluctable monument to his life work.